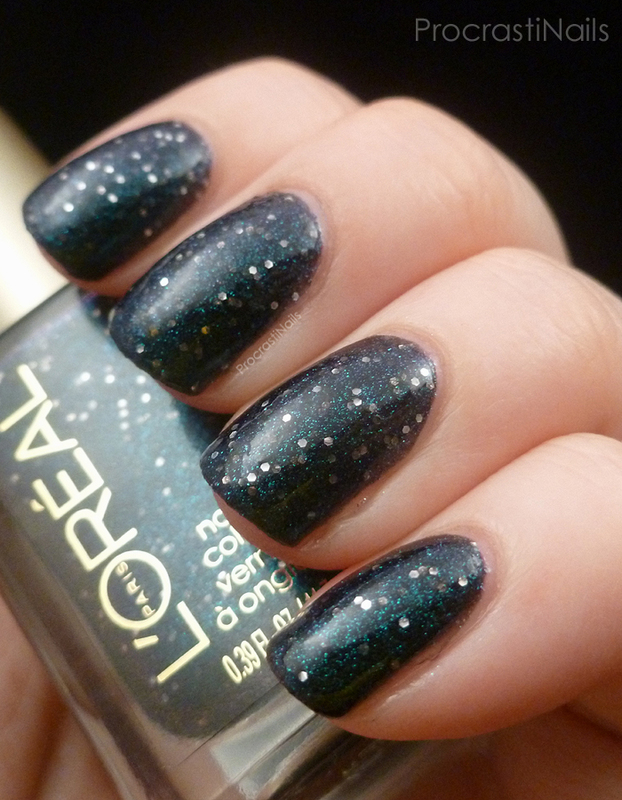 Can you believe this was my first L'Oreal Paris polish?! I was so surprised when I picked it up the other day and noticed I didn't have any other L'Oreal bottles in my stash. But what a choice for my first. Hidden Gems is a stunning multichrome textured glitter, though sadly the textured nature of the polish takes away any of those other multichromatic colours once the polish is out of the bottle and on to your nails. 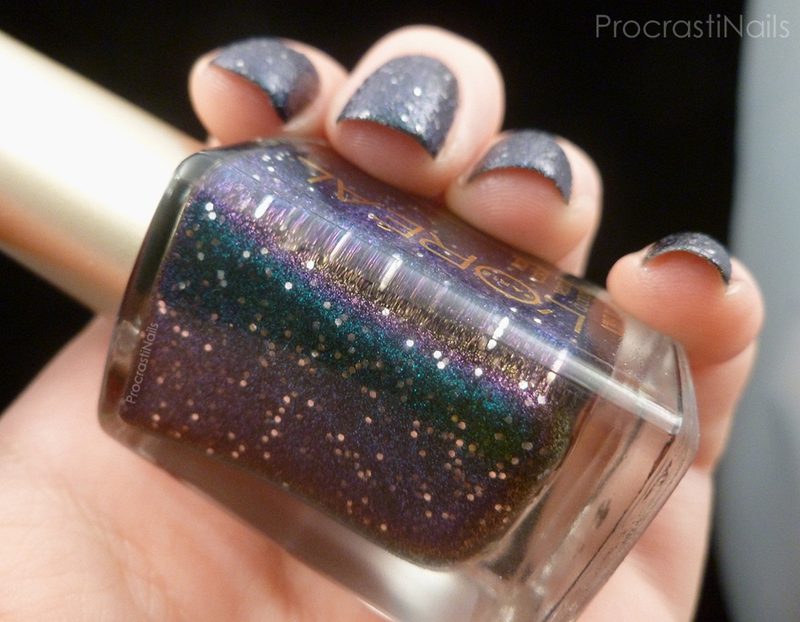 It's still lovely to look at, and I've swatched it for you both with and without top coat. 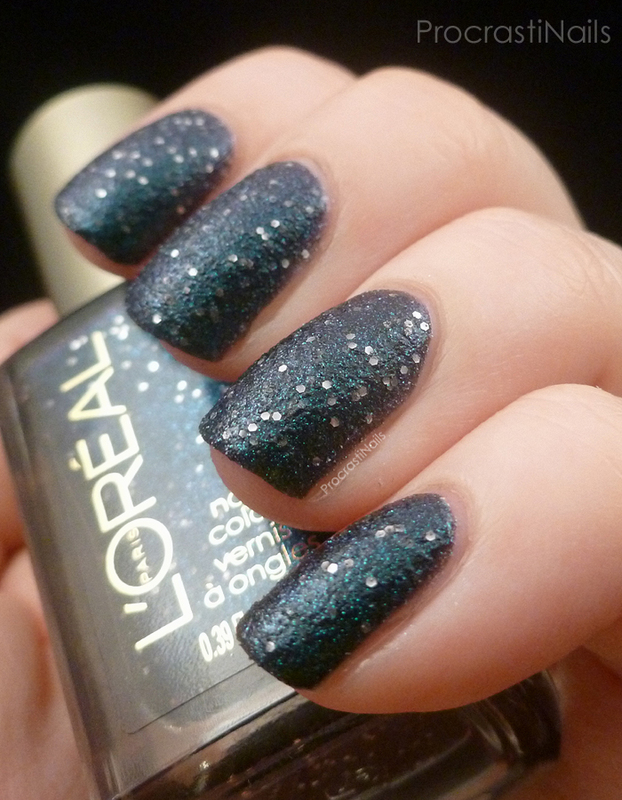 L'Oreal Paris Hidden Gems is part of their new Colour Riche Gold Dust line. As you can see from the above picture (three coats of Hidden Gems) on the nail this comes through as a solid and sparkly turquoise textured polish with a scattering of silver hex glitters. 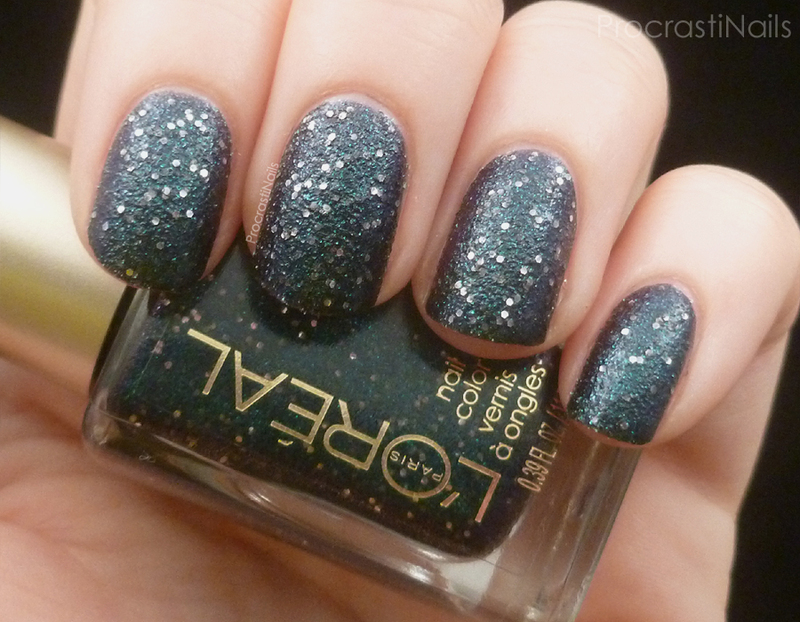 The scattering of glitters reminds me a lot of Essie Belugaria. Once again we get that impression of treasure scattered throughout a surface, though this one gives me the impression of deep ocean depths... Lush deep turquoise currents pushing a scattering of lost treasure all about. Stunning! One thing I find interesting is that the polish itself is actually a moderately sheer dark blueish-purple base with a generous mixture of coloured microglitters scattered throughout. There's so much of the microglitter (not to mention the larger silver glitter) that after two or three coats it's built up on itself so much that it appears like the base was a solid turqoise mass on it's own to start with. Because of this I've gotten it in my mind to try layering a single coat of it over black to make the base for a galaxy mani. Hmm! Don't get me wrong, this is still a lovely polish, both with and without top coat. It's just that the multichromatic nature is what drew me to the polish in the first place. Ah well. This is pretty especially with the shimmers peeking through.